JNN 18 July 2014 Islamabad : The Pakistani military said its jets killed 35 suspected militants on Wednesday as part of an anti-Taliban offensive hours after U.S. drones attacked another area nearby and killed up to 20 people. On Wednesday, Pakistani jets killed 35 suspected militants in the Shawal valley, a remote stronghold on the Pakistani side of the border opposite Afghanistan’s Paktika, Pakistani military officials said. 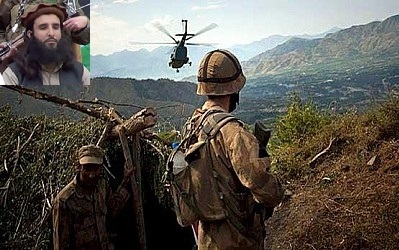 Hours earlier, U.S. drone aircraft attacked fighters in Datta Khel, a town in North Waziristan region near the border. Resident Malik Wakil Khan, said 18 bodies had been recovered from the rubble of a compound. Pakistani security officials gave tolls of from 15 to 20 killed. Pakistani military officials said there was no connection between their air strikes in the Shawal Valley and the U.S. attack in North Waziristan. Within days of the resumption of U.S. drone strikes, Pakistan announced a military offensive designed to push the Pakistani Taliban out of North Waziristan. More than half a million civilians were ordered to leave their homes before ground operations started. Pakistani Taliban reportedly confirmed Wednesday the arrest by security forces of their senior commander, Adnan Rashid, who was convicted of trying to assassinate former president Pervez Musharraf and was also one of the many inmates who escaped from a prison in 2012. Reports earlier suggested that Rashid was arrested by the Pakistani army in Shakai area of South Waziristan this week. He was reportedly injured in an earlier strike in North Waziristan and was arrested after fleeing the ongoing airstrikes in the region, Xinhua reported. The army has not yet confirmed the arrest, but section of the Pakistani media has reported the arrest. The Tehreek-e-Taliban Pakistan (TTP) has confirmed that Adnan Rashid was arrested, Geo television reported. The TTP accused a splinter Taliban group in South Waziristan of passing the information to the security forces, which eventually led to the arrest of Rashid. Sources said that Rashid was shifted to an undisclosed location through a helicopter. The TTP has distributed a pamphlet in parts of South Waziristan, saying they would take revenge of the arrest of their leader. This entry was posted in Asia Pacific, Pakistan News and tagged North Waziristan, Pakistani military, Pakistani Taliban, taliban. Bookmark the permalink.